Glaz-Tech Industries offers a product that is resistant to damage from hard water, soap and humidity. Standard glass enclosures eventually get damaged and inevitably cause your enclosure to appear dirty. In time, cleaning agents and chemical reactions make the surface of your glass enclosure more strenuous to maintain and clean. Glaz-Tech’s added line of Guardian’s ShowerGuard® prevents those unwanted features and adds durability and longevity to your shower enclosure. It’s clear appearance and low maintenance makes for an ideal investment for a shower enclosure that's both durable and beautiful. Clarity. The Difference is Here. Stop investing in various coating chemicals, applications and other means of maintaining your shower enclosure clean. With Guardian’s ShowerGuard® line you eliminate having to spend precious dollar amounts on chemicals that will eventually wear off. The clarity and your enclosure’s benefits lay with innovative glass applications. Its surface is permanently sealed during manufacturing with a patented ion beam process. Unlike spray-on or wipe-on treatments that eventually wear off, the protection provided by ShowerGuard® glass is part of the glass itself, so it never needs to be reapplied. 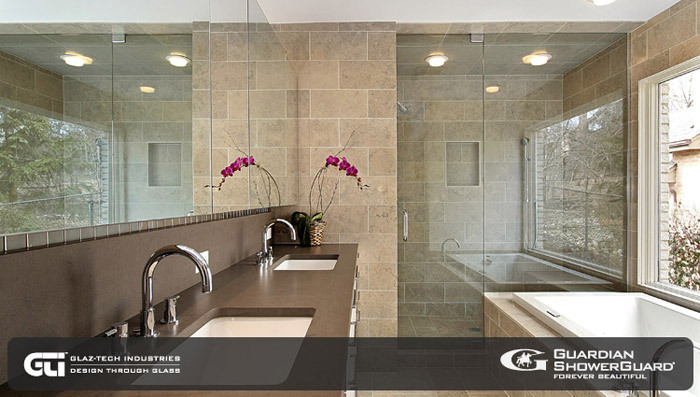 With just a minimal amount of cleaning, ShowerGuard® glass will stay beautiful for years to come. ShowerGuard® glass is backed by a 10-year limited warranty. There are standards and then there are custom applications. Glaz-Tech Industries takes strides in providing basic and complex fabrication options. Whether you’re inquiring about a specific pattern, Glaz-Tech’s state-of-the-art fabrication line and WaterJet platform gives you the flexibility to design accordingly. Basic or custom fabricated glass, GTI is the ideal source for a wide range of reliable applications. Thickness availability comes in 1/2" (12mm), 3/8" (10mm) and 1/4" (6mm).